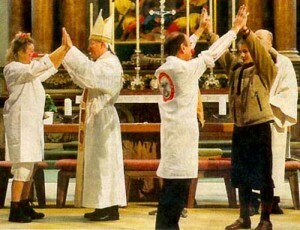 In spite of the fact that many if not all of the clergy-signatories of the Statement had sworn before God to “hold to my dying breath the belief of the Fathers in the charism of truth, which certainly is, was, and always will be in the succession of the episcopacy from the apostles… [and]that the absolute and immutable truth preached by the apostles from the beginning may never be believed to be different, may never be understood in any other way” (cf Oath Against Modernism), they had the audacity to claim for themselves “a true autonomy and academic freedom in the face of authority of whatever kind, lay or clerical, external to the academic community itself” (Land O’Lakes Statement – Article 1). Next Article Are You or Your Children Addicted to the Net? Thank you for writing this article. I would like to respond to your question about why Pope Paul VI removed the Oath Against Modernism. First, I would like to recommend you to my articles here on Catholic Lane about reflecting on the Catholic Church’s Memory and Identity. There are four in that series, plus an additional follow-up about Paul VI and the Natural Law. After reading those, I think you’ll find some good food for thought. Much of your answer comes down to the vision of Paul VI as laid-out in Ecclesiam Suam. We should hang together rather than hang separately. I am saddened to see Mr Verachios ‘s article and its disgraceful image. Criticism of Paul VI, whose process for beatification process was begun in 1993 is unfortunate. Mr Verrechio may be more Catholic than the Pope and have access to knowledge denied to Rome and the pope, who is infallible in matters of faith and doctrine to be help by all the faithful. His access to the Holy Spirit may be better that was Pope Paul’s. I am sure the Pope made his decision in good faith, and Catholics at the present time should show a united front to the secular world. I agree that few decisions of popes are infallible, but they should be considered with respect. Many Catholics disagree with Pope Paul VI on contraception, and Mr Verrachio’s criticism of him weakens the Church’s stature. To say the decision was that of the CDF and not of the Church is not honourable. Seeing views like this are not helpful for Catholics, and I hope few in CL would agree with it. But Mr Verrachio’s article also leads to lack of support for the authority of the popes.